Smoothie School: The Gray Stuff — MommiesRun. One of my favorite things in the world is a good smoothie filled with fruits, veggies, protein, fats, adaptogens, seriously, if it's healthy, I'll put it in my smoothie. If you ever waste your time like I do checking out people's Instagram stories, then you've probably seen my collection of smoothie art. I'm obsessed. I'm not only obsessed with the ingredients in the smoothie, but the toppings on my smoothie. Oh yes, smoothies need toppings. "How much spinach do you use?" "What the heck is Maca?" "What does Vital Proteins do for you?" But the most common request is for exact measurements. Ummmm, most of the time I just throw things in and hope for the best. However, I aim to please, so I'll be trying to write down exactly what I do in order to post here. Because I love you. I'd also like to mention, I am not a food blogger. I don't have a fancy camera, nor do I know how to use one. All of my pictures come from my iPhone, and unless one of you wants to donate a fancy camera to the cause, it's going to stay that way. Today I created a beauty that I couldn't help but name "The Gray Stuff", because it's gray, duh. Apparently when you mix blueberries and lots of green stuff, it makes gray. I'm not complaining though, because like that little candlestick says, "Try the gray stuff, it's delicious". I didn't get too crazy with this one, mostly because it's a rest day for me which means I'm not in recovery mode, I'm in eat something delicious mode. And this smoothie delivered. I did end up getting super crazy with my toppings though since the smoothie fit perfectly in a little bowl. 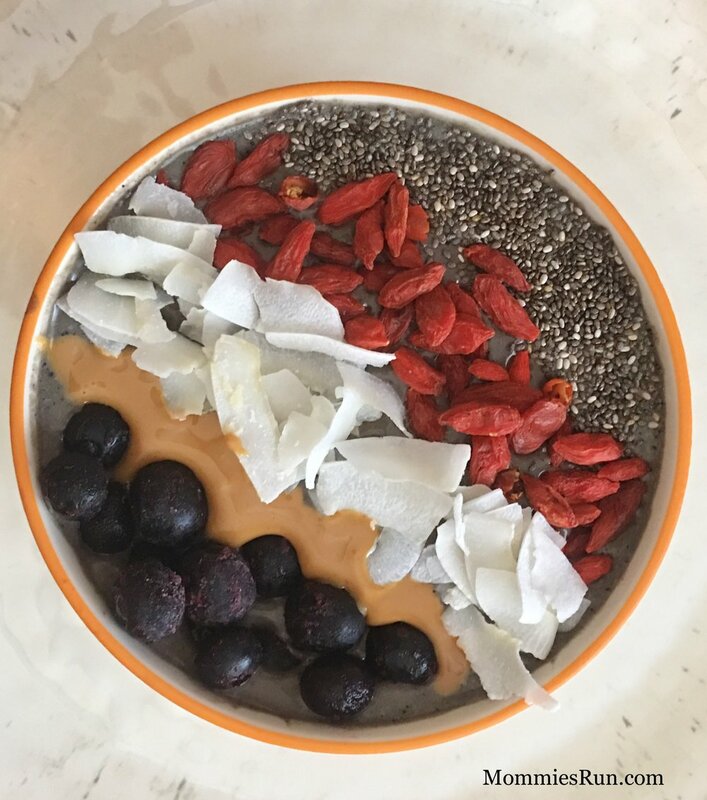 Chia seeds, goji berries, unsweetened coconut flakes, peanut butter, and frozen blueberries took The Gray Stuff to the next level. I'm all about making my own almond milk, but lately I've just been making some quick hemp milk to use as my base. It couldn't be easier, and it's a great way to add in some omega-3 fatty acids which is *possibly* beneficial for heart health, but definitely not harmful. Remember, I'm a pharmacist which allows me a great opportunity to do tons of research on health claims! More on that another day. Hemp milk is great in smoothies so let's go with it. In every smoothie, besides the obvious fruits and veggies, I like to make sure and have a protein source and a fat source. My go-to protein powder is any of the collagen whey protein flavors from Vital Proteins. The collagen is so important for joint and bone health and the protein is the only protein that doesn't taste chalky and protein-y to me. For this smoothie I went with the Cocoa Collagen Whey and my fat source was the hemp milk plus some peanut butter. Please make sure and only use nut butters with minimal ingredients. I used the Simple Truth brand that only contains peanuts and sea salt, no added sugars or oils! As far as blenders go, Vitamix is the MVP in my opinion. I've had other brands, but I use my Vitamix daily and it is life changing. I get nothing by telling you this, I just feel like you should know. It's now in your hands. Will you try The Gray Stuff?